Throughout my academic journey I have constantly changed the field in which I wanted to study. I grew up wanting to be a veterinarian, a doctor, a surgeon and now a marine biologist. When I finally made the decision that I wanted to be a marine biologist my family’s first reaction was “Why don’t you get an actual career?”, instead of being supportive of my career choice they diminished it to nothing. For a time I even considered changing the field that I wanted to study. I wasn’t particularly distraught by my family’s reaction but subconsciously I knew that they considered it a waste of time and resources. 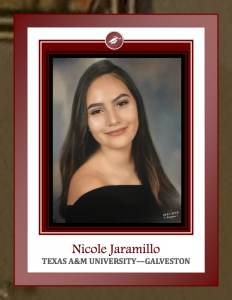 With the May 1st college decision deadline upon me I decided to follow my heart and chose to go to Texas A&M Galveston and major in marine biology. Around the world today there are currently 100,000 marine creatures who die from plastic entanglements alone. Furthermore, there is an abundance of marine creatures who get stranded along the coasts and beaches of a variety of places. There is currently not much emphasis on marine animals, the only time they are ever brought into the spotlight is when they are on the verge of extinction. After acquiring my major in marine biology, I will then go into wildlife rehabilitation/wildlife veterinarian and eventually into animal law. In wildlife rehabilitation/veterinarian I see myself making a positive impact in that I will be helping animals that cannot help themselves. Nursing animals back to health so that they can return to their homes without further hindrance. While recovery processes can be hard, humans and animals alike both require constant support and vigilance so that they can make a full recovery. Whether it be by performing surgery or simply being there as a rehabilitator and nurturing the animals so that they don’t lose motor functions. Ultimately, my role would be to make it as easy and smooth as possible for these animals so they don’t have to suffer through the recovery process and quickly be able to return to their homes. In animal law I will be able to help implement laws to prevent the endangerment and possibly even extinction of marine animals. I would be an advocate for animals that can’t speak for themselves and make an everlasting impact that would help these animals for years to come. While there are many laws prohibiting the killing of these animals, turtles for instance, they are still hunted for their skins and often times the people committing these crimes are not reprimanded. As an animal rights lawyer I would make sure that the consequences for breaking these laws are followed through so that these animals are no longer killed on a vast scale. In the long run, the impact I make in the marine biology field will be so vast and groundbreaking that it will be considered a monumental stepping stone for future generations of animals and people to come.